With the holidays quickly approaching, I thought I would gear everyone up for giving edible presents! It truly is one of the most personal things you can do for the ones you love, bestowing upon them the gift of something you have crafted yourself, especially when it is made with wholesome ingredients. 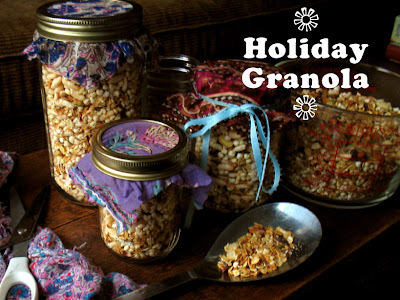 Here is a recipe for “holiday granola” that pleases the palette of adults and kids alike. It has many wonderful flavours, textures and you can substitute many of the ingredients to suit your preferences. The combination of orange zest and cranberries makes the granola taste extra special. I strongly suggest making a trial batch for yourself because that way you won’t eat your entire stockpile of gifts! Trust me. This granola makes a wonderful breakfast on top of organic yogurt or soymilk because it is so filling. It’s loaded with fiber, protein, healthy fats and essential vitamins and minerals. I even keep a little bag of it in my purse when I’m going out for the day – it’s great trail mix! As with all of my recipes, I always recommend using organic ingredients. If money is an issue, at least buy an organic orange because you’ll be using the rind. Organic oranges are not sprayed with pesticides or wax, which will otherwise make their way into your delicious granola! Put the butter in a small saucepan and melt on low heat. Add maple syrup, cinnamon, nutmeg and orange zest. When all the ingredients are well combined, pour over the rolled oats and stir well. Put oats on 2 baking sheets and bake for 15-20 minutes, remove from oven and stir, bake until golden brown (usually another 15-20 minutes). While the oats are baking, roughly chop the almonds, walnuts, cashews and cranberries and set aside. Once the oats are toasted and cooled you can combine all the ingredients. If you like, add some puffed cereal grains like brown rice and millet. These bulk up the granola, but are very inexpensive. They serve as a nice contrast against the richness of the other ingredients. I like to put the granola in old mason or jam jars, top with some beautiful vintage fabric, and tie a bow with the recipe attached. That way, your lucky recipients can make it for themselves, so it really is the gift that keeps on giving! I will give this granola to my dad, sisters and neighbors along with the recipe. It is a healthy alternative to cookies and sweets. Dear Sarah, this recipe is perfect! I made it just today and will definitely be making it for my family and friends this Christmas. sorry for making you excited that you have 3, no 4, comments. you can erase them. eportfolio means “steph”. it’s work-related. wow. I recognize those pieces of material. Good idea!